“A building is only as good as its foundations”; basic advice which applies just as readily to a model railway layout as to a 3 bedroom semi. Pound for pound and hour for hour baseboards are the most important element of any layout and time and money spent here will be re-paid over and over again. In general layouts tend to be either portable or permanent. Whilst sturdy and accurate construction is obviously a must if the layout is to be dragged around the exhibition circuit for 10 years or more it is just as important if the layout is to be permanent. Murphy’s law declares that none of us are immune from the ‘fickle finger of fate’ determining an unplanned re-location and a ‘really permanent’ layout that can only be moved with the help of a chainsaw is less than desirable. Group member prays to the ‘Great Model Railroad God’ in the vein hope of solving the eternal baseboard 3D jigsaw puzzle. 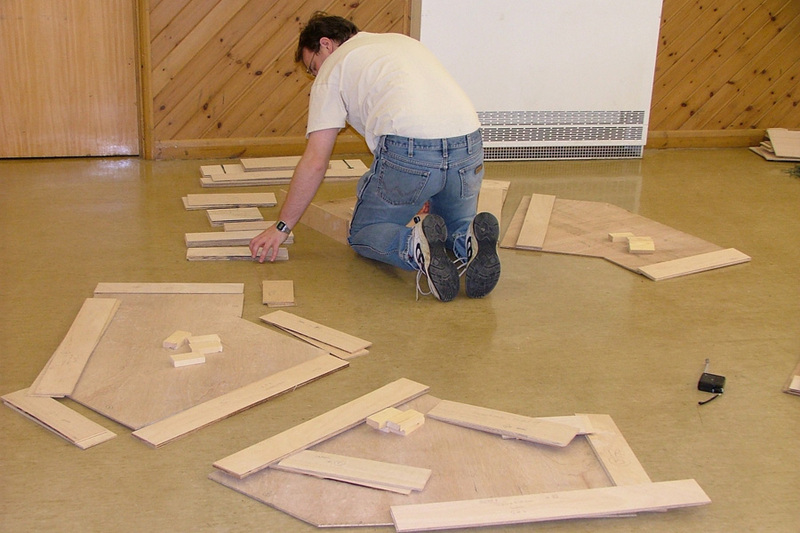 Accuracy of construction, whilst desirable for a permanent layout, is essential for exhibition layouts as any inaccuracies cannot be hidden, or ’fixed’, as easily as they might be in a permanent layout. In order to achieve true ’right angles’ and spot on dimensions in the baseboards there is no substitute for a calibrated saw table. For those of us who do not have access to one of these tools B&Q on a quiet weekday afternoon is a godsend. Even if you have to pay extra for cuts over and above the ’free allowance’ knowing that the large sheet of material is being held securely and cut with a precision saw is reassuring, even if you do have to keep an eye on the old codger operating it. I prefer to use 6mm plywood sheet for the top of the baseboards, with 6mm plywood sandwich construction for the front and back (this enables using the outer 6mm ‘skin’ as a contour board to match the scenic levels. For the ends, through which the baseboards bolt together, I use 12mm plywood as this is more robust and can accommodate bolts and dowels easily. When building a number of boards it is good advice to work out a cutting sheet in order to extract as much from each board as possible. Of course getting them cut in the store also means you can use the largest sheets available without wondering how to get them home.